In recent months, a pattern of cases has come to light in which inmates in the state’s correction department were reportedly not provided proper medical care. Sen. Fasano calls for an examination of alleged medical neglect in the state’s prison system at a press conference joined by Sen. George Logan (far left), Sen. Heather Somers (far right) and the family of Wayne World, an inmate whose deadly skin cancer went allegedly undiagnosed for years while in the state’s prison system. 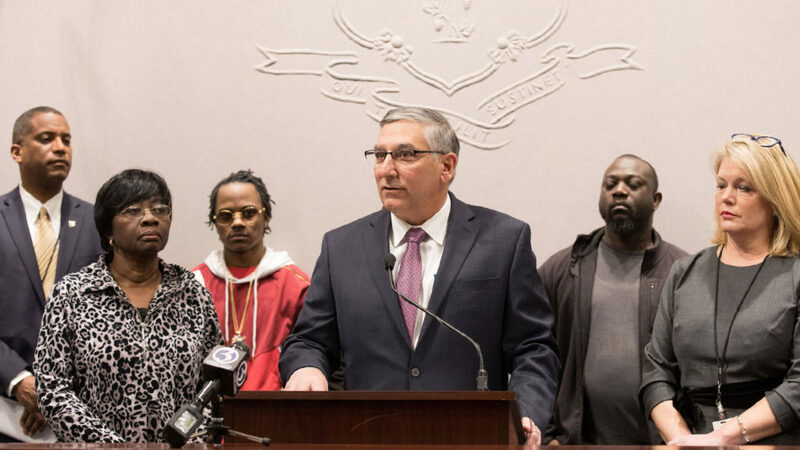 At a press conference at the State Capitol today, Senate Republican President Pro Tempore Len Fasano (R-North Haven), State Senator Heather Somers (R-Groton), co-chair of the state’s Public Health Committee, and State Senator George Logan (R-Ansonia), vice-chair of the Public Health Committee, called on fellow lawmakers to join them in holding a public hearing on the state’s inmate medical care system and asked for full transparency from the Department of Corrections (DOC) regarding UConn Health’s Correctional Managed Health Care unit (CMHC). In recent months, a pattern of cases has come to light in which inmates in the state’s correction department were reportedly not provided proper medical care. Systemic failures were documented by the State Auditors in a 2017 report and multiple cases have also been reported in the press in which medical neglect of prison inmates has allegedly led to serious injury and death. Joined by Carrie World, the mother of inmate Wayne World, whose deadly skin cancer allegedly went undiagnosed by CMHC for years, the lawmakers renewed their requests for a report from the DOC so that the legislature can join DOC in conducting a complete review of the state’s inmate medical health care system, which has been managed by UConn Health for the past 17 years under a no bid contract that has cost approximately $80 – $100 million annually. The lawmakers pointed to Mr. World’s case as one example of the reported cases involving potential medical neglect. Despite having an aggressive rash that led to open wounds, Mr. World has said he was repeatedly denied requests for a biopsy by CMHC over a three year period. While the rash began in 2012, Mr. World was not taken to the hospital until late 2015 after he was found to be bleeding through his medical gauze and only then was he diagnosed with cutaneous t-cell lymphoma, a fatal skin cancer. Republican lawmakers have long sought to eliminate the no-bid contract for UConn Health and replace it with a request for proposals (RFP) process to ensure quality of care while also reducing costs. Sen. Fasano, Sen. Somers and Sen. Logan are calling for a public hearing to bring transparency to the state’s correctional health care unit and begin an open process involving the legislature to seek solutions. They are also asking that the Department of Correction provide the legislature with a report that was completed by the DOC and an outside prison consultant that investigated 25 cases including eight deaths related to the correctional health care unit.